The Scottish Jewish Archive Centre encapsulates the whole spectrum of the Scottish Jewish Community, highlighting where significant communities were established, the various Jewish organisations and enterprises that existed and still to this day. Not only serving its purpose as a visitor attraction, the centre is also a significant cultural and educational resource, containing vast records of data and information. It is also the first port of call for tracing Jewish families in Scotland. The Archives Centre is home to a series of exhibits and displays pertaining to the roots of Scotland’s most significant Jewish communities in both Glasgow and Edinburgh, including photographs of immigrants arriving in Scottish ports and stations from Continental Europe and a host of religious related artefacts, giving visitors an introspective insight into the faith. Arguably the most significant exhibit in the centre is the ‘Jews of The Gorbals’, once the most populous Jewish community in Scotland from the 17th Century until the early 20th. The Centre also charts on the sense of community spirit and altruism in Jewish neighbourhoods across Scotland, with the establishment of organisations devoted to the welfare of the community at large. For those wishing to trace ancestors and Jewish families living in Scotland before the Second World War, the Scottish Jewish Archive Centre is an invaluable resource, home to a large database referencing accurate demographic information from over 70 sources ranging from synagogue registers, school lists, naturalisations to death registers. This large database contains a series of useful information on over 23,000 Jews living in Scotland before the outbreak of the Second World War. The Archives Centre continues to expand its collection of documents, photographs and memorabilia on the Holocaust era, recounting the experiences of those who came here as refugees from Central Europe during the 1930s or as survivors after the war. There is an intriguing story to tell of how many hundreds made a new life in Scotland and of the great contribution they made to Scottish society. The Scottish Jewish Archive Centre is conveniently situated in the cultural quarter of Garnethill, walking distance from Sauchiehall Street and near to Glasgow School of Art. 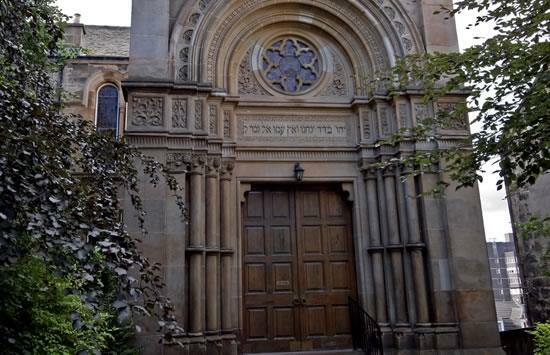 Admire the opulence and architectural features of Scotland’s oldest Synagogue, preserved as a Grade ‘A’ listed building prior to your experience at this highly informative centre of cultural excellence. The Centre is opened on some weekday mornings and one Sunday afternoon of every month and is by appointment only. To arrange a visit to the centre, please contact the reception directly.